1. Rick Pitino’s Cardinals were riding a six-game Big East winning streak and a seven-game run against Syracuse that dated back to 2007 (which prompted Jim Boeheim’s worst moment until his worst moment — start at 3:30). At no. 19 in the latest AP poll, they were one of the hottest teams in the country. 2. Despite shooting only 34.4 percent overall and 1-of-15 from 3, narrowly losing the rebound battle, and getting to the line at about half its usual rate, Syracuse still eked out a win in a tough road environment. 3. 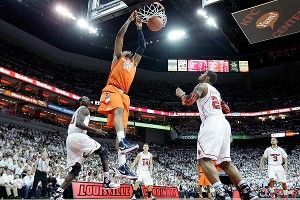 Syracuse forced 16 Louisville turnovers, including 12 steals. This is nothing new for the Orange, who force turnovers at the sixth-highest rate in the country and steal the ball at the third-highest rate. But against a Louisville team with a low turnover percentage and strong guard play, it’s still very impressive. 4. The Orange worked one of the best interior defenses in the country for seven dunks and 11 layups. If the Cardinals couldn’t stop them inside, who will? 5. The Orange are now 13-1 in what has been one of the best conferences, if not the best, in Division I in the past decade. 1. Exactly zero of Louisville’s six wins came against a ranked opponent, and it’s about time we face facts — the Big East simply isn’t that great this year. Six straight wins is six straight wins, but nothing about Monday night’s game showed me that Louisville belongs in a serious top 15 discussion. When a team like that struggles to even reach 50 points, you’d expect a championship-caliber opponent to win by double digits, not the skin of its teeth. And if Peyton Siva hadn’t defaulted into out-of-control mode, the Cardinals might have won anyway. 2. Syracuse made exactly three field goals that weren’t dunks, layups, or foul shots. Only two of those came outside the paint, and one was essentially a layup. In total, the Orange were 2-for-29 outside the paint. TWO FOR 29. Those are extreme numbers that nevertheless reflect a season-long trend. Syracuse excels at shooting from inside the arc (53.5 percent, 18th-best in the country) and struggles from 3 (34.5 percent). You’ll find very few recent national champions that couldn’t rely on bursts of hot outside shooting when times got tough. 3. The Orange conceded 16 offensive rebounds to a team that Ken Pomeroy estimates as 216th in the country by effective height. By that same measure, Syracuse is 12th. Now, a lot of that stems from the 2-3 zone the Orange employ. Boeheim recruits tall, quick players to fit the system, and this year he’s crafted the 14th-best defense in the country. And though the Orange nab offensive rebounds at the 28th-best clip in Division I, they’re the eighth-worst at defensive rebounding. It looks like an anomaly on the surface, sure, but it’s actually fairly typical for a zone team — the basic wisdom says that when a team doesn’t play man-to-man, nobody has a specific player to box out, making it easier for the offensive team to crash the boards. This can be very problematic against a big team that shoots well. Just ask Baylor, another long, zone-heavy team that allowed offensive boards on almost 50 percent of all shots in earlier losses to Kansas and Missouri. The question is, will Syracuse be able to keep teams off the offensive glass and avoid a shooting slump for six straight games in the tournament? 4. For a big, strong, physical team, the Orange are terrible at getting to the line. They made just seven trips Monday night, including only one in the final 17 minutes of the game (excluding an intentional foul by Louisville with two seconds left). On the year, they rank 308th in free throw attempts per field goal attempt, and that might be the worst sign of all. How can Syracuse create points in a tight game down the stretch when it can’t make it to the line? Louisville’s late 15-2 run, propelling them to a 51-46 lead with four minutes left, was possible in large part because Syracuse couldn’t draw a foul and halt the momentum. When you look at potential fatal flaws, this one is glaring. For a team with a 26-1 record, there’s been a lot of conversation about whether Syracuse is truly elite. Coming into Monday’s game against Louisville, people like me were hoping to crack the Orange riddle. Instead, the mysteries persisted, with every flaw and strength exaggerated en route to the same final result — a win. The only thing I can say for sure is that Syracuse appears — and even this has to be qualified — to be a very tough team. The Orange are now 9-1 in games decided by 10 points or less, and their resilience in Monday night’s home stretch was impressive. When Louisville took its five-point lead with four minutes left, the KFC Yum! Center (easily the most embarrassing venue name in Division I athletics) was rocking. But over the next two minutes, all five Syracuse players factored in as they righted the ship and reclaimed the lead; Brandon Triche nailed a jumper, Fab Melo got to the line and hit both, Dion Waiters found C.J. Fair for the go-ahead bucket, and Kris Joseph followed that with a crucial steal. For those 100 seconds, the Orange played like potential national champions. Will a trait as slippery as “toughness” be enough to keep Syracuse from flaming out in the second round or Sweet 16? We’ve seen enough games against quality opponents to know that the strong Orange offense isn’t quite itself when the level of competition rises (52 points against Louisville, 55 in regulation against Georgetown, 63 against West Virginia, 60 against Cincinnati), but does the fact that they’ve won each of these games signify grit or luck? Anyone who claims to know the answer is lying. If you pressed me for an educated guess, I’d probably turn vague on you and advise extreme caution. The numbers and results don’t lie — the Orange are an extremely vulnerable team, right up until the moment when they’re not.